Over the last few years newsrooms have focused more on "transactional engagement", or the number of followers, endorsements and social shares stories receive, than on "relational engagement", where the public gets to participate, collaborate and even lead "the information health of their community". 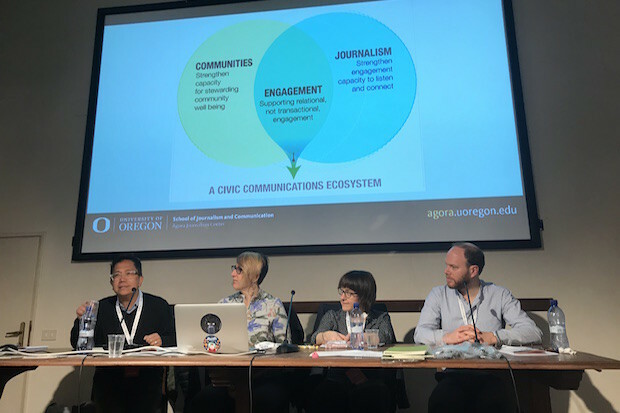 Highlighting the distinction between the two approaches, Andrew DeVigal, Endowed Chair in Journalism Innovation and Civic Engagement at the Agora Journalism Center, kicked off a panel on "community-minded" reporting at the International Journalism Festival in Perugia today (13 April). The Agora Journalism Center recently launched Finding Common Ground, an initiative offering funding to European and North American news organisations who want to expand existing engagement work. Three of the seven organisations that have received funding joined the panel today to talk about their planned projects and their approach to working for and with their communities. In Sacramento, Capital Public Radio has been covering the housing crisis in the area for the last year and a half through its project 'The view from here: Place and privilege', looking at the history, politics and economics of housing. The team wanted to create a forum where residents could come together to share their experiences and build empathy. They came up with the concept of 'Story Circles', where the radio station partnered with 12 community groups to host in-person conversations between 15 people at a time, who had to share "a personal story of when a home had made a difference in their life", said Jesikah Maria Ross, senior community engagement strategist at Capital Public Radio, and the facilitator of the meetings. "This deceptively simple process opened up the space for people to share their struggles, hopes, dreams and fears which created an emotional intimacy in the room between people who usually wouldn't be in the same room together. "By the end, people had a sense of what they had in common and what was different, and they could analyse those differences before talking about creative responses and solutions." intentional curation – the project's community partners invited half of the participants, who were people that had been hit hardest by the crisis, and the other half, who were residents with more resources, were invited by the radio station. With the grant from Finding Common Ground, the radio station and its 12 partners will be hosting more 'story circles', improving the methodology and approach and then co-creating a downloadable guide for any organisation or group who wants to host similar community events on the topic of housing. The project, led by Andrea Wenzel, professor at Temple University, and media consultant Sam Ford, aimed to explore what political polarisation looked like at a local level in rural Ohio County following the US election. Wenzel and Ford did a research study looking at how partisan divide had affected the area's "storytelling networks", which are formed of community organisations, geo-ethnic media, and residents. "If we might think the well is poisoned at the national level, are people reading the same local newspapers, are they sharing spaces, in what ways might they still be sharing resources and is there a way to expand?" Wenzel said. "When it came to local news, people on both sides of the political divide were using same of the same news outlets, and they said there wasn't any nuance in how they were being represented in the media." Local journalists, community groups and residents who participated in the study came together to look at what type of projects and media initiatives would be useful to address these issues. Wenzel and Ford are collaborating with digital hyperlocal news site The Ohio County Monitor on two community engagement projects: Society Columns, where locals become regular contributors reporting on what is happening in their area; and the Liars Table, a listening tour The Ohio County Monitor is doing around public spaces where people, mostly elderly men, convene to discuss local issues. "They are looking at how they could connect that information that is being shared to the online audience, because the people taking part in these face-to-face conversations are not online, and not everyone would feel comfortable interacting in those spaces. "These are not projects that can be picked up and dropped somewhere else, because they're not scalable and we don't want them to be. We are experimenting with a model where the process is the one that can be portable, which puts together research and participatory project design before conducting the pilot projects." The next step is using the funding to expand the number of communities involved and to connect groups of refugees in rural Kentucky with long-time residents, as well as examining how this model could work in Philadelphia. Last year, German newspaper Zeit Online set up a pop-up section on the website to cover the upcoming elections in the country. The team decided to create a platform similar to Tinder but focused on political dialogue, which used an algorithm to match people with opposing political views and to encourage them to engage in conversation. As part of the initiative, called Germany Talks, people arriving on the website would be asked a series of five questions, such as 'has Germany accepted too many refugees? ', 'should Germany abandon the euro?' and 'is the West treating Russia fairly?'. They were also given more information about the project and if they said they were interested in meeting someone who saw these issues differently, they were asked for their postcode and contact information. The algorithm matched 1,200 people who lived close to each other, but who had opposing views, into pairs. Zeit provided them with some guidelines on having a productive conversation before the pairs met individually on the same day last June. Only a few of the meetings were covered by Zeit journalists, and participants were asked to send selfies and feedback on their conversations back to the newsroom. "Our aim is not to change people's minds, but to help them have a better understanding and position towards other people's opinions," said Philip Faigle, managing editor at Zeit Online, and the project's leader. "We have people who no longer speak to each other and for community and society that's dangerous. "In the feedback we received a lot of people said they expected the other person to be an extremist, but when they came together they recognised the differences aren't so big and they recognised the presumptions of their opinions. Why does someone believe there are too many refugees in this country for example? That's an interesting thing to hear." Germany Talks got the attention of other news organisations in other countries who wanted to replicate it, so a global version is currently being developed by Zeit. Through the My Country Talks platform, news organisations will be able to set up their own projects as the website will produce a widget with questions for them to embed, as well as take care of the algorithmic matching, communication and event organisation aspects. Zeit Online is currently looking for partners for My Country Talks, with more than 20 global organisations including The Globe and Mail, La Repubblica, Morgenbladet and more having already joined. Once it launches in early summer, the platform will be open and available to any news organisation interested in setting up one-on-one discussions between people with opposing viewpoints.